What do you do in your daily and weekly routine to go beyond the usual and continue lifelong learning? Below is an aggregation of what I enjoyed through the week to keep me thinking about the bigger picture or to get my mind out of the daily routine of things. It consists of my usuals (GeekBeat.TV, This Week in Tech (TWiT), MacBreak Weekly (MBW)), my broadening (Technology, Entertainment, Design (TED)), and some things I’m specifically interested in learning (This Week in Photo (TWiP)). Who knows, maybe I’ll get better at this photography and video thing. I thought that TED released an interesting pair in the first two videos. They seemed to compliment each other as one challenged the innovation and growth occurring and what is the true race in competition (against the machines). For the above reason Erik’s video was the one I most enjoyed this week. 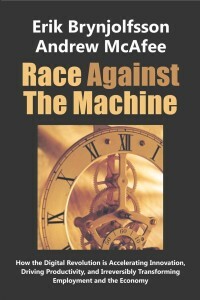 I’ve discovered his book, Race Against the Machine , which discusses the how the Digital Revolution is Accelerating Innovation, Driving Productivity, and Irreversibly Transforming Employment and the Economy. No small set of feats, right? Anyway – enjoy my wrap up!